It’s mid-winter here in the Georgia Piedmont. I did see a sluggish Cloudless Sulphur Butterfly last week, on a 67F day, in my yard. That said, the general butterfly hiatus is some challenging. That’s especially so when I open Facebook and the Ian’s and Bill’s photos from the likes of what Peru, Indonesia and Bolivia, India. Mike and Javi put me over the top, when they share butterflies just seen in the Lower Rio Grande Valley in Texas! My many trips to the HolyLand jump out at me as I scan my Media Library, and here’s one that sure qualifies for an exciting find. This Lasiomatta megara emilyssa jumpstarted my blood pressure when I spotted him sunning on a rock on a trail on Mt. Meron, in the very northern Galilee region of Israel. HolyLand butterflies dislike close approach, and for that I stopped where I did, Macro- lens and all, for closer approach would have left me with zero images. They flee, and they flee at high speed. This butterfly is not uncommon, but at the same time is rarely seen. Do I plan to travel to Indonesia, Chile or Slovenia? No. But I’m booked for the Lower Rio Grande Valley, and kind friends continue to beckon me, to far, far away locales. Scouring the Upper Galilee region of Israel for butterflies is a Joy! that I’ve done, many times. 99% alone, the entire time, amidst fields of fresh Spring wildflower blooms, I Thank G-d for the opportunity. I tell you I often stop, scan the meadows of the Kedesh trail, and struggle to understand why more folks don’t do the same? Thousands of years ago, They stopped their important missions, to amaze at those same species of butterflies, and here I am fortunate to do the same. 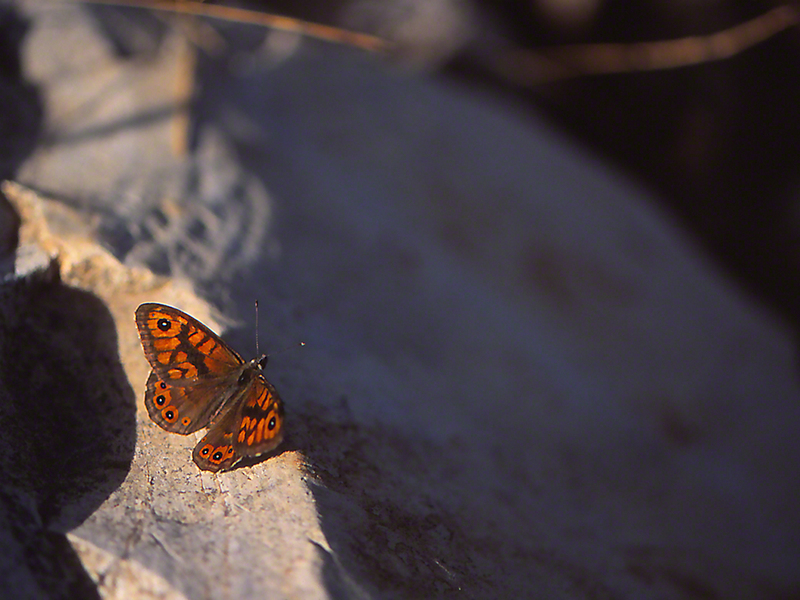 I am especially fond of Satyr butterflies, and this trip to Kedesh trail produced a good discovery. 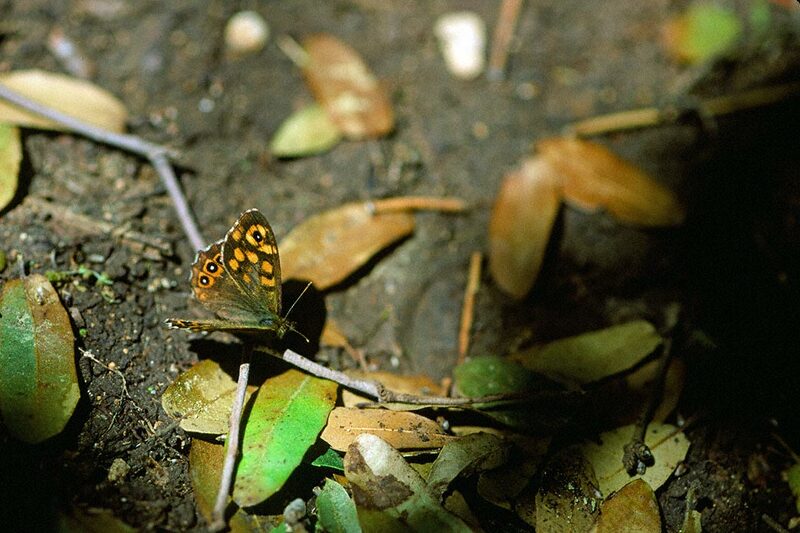 I was scanning the tiny stream that runs along part of the trail, it mostly dry, but recent rains left the stream bed wet enough to nurture a brown satyr that flew in. I quickly made my approach. Daddah! A handsome satyr butterfly. I carefully moved in and was thrilled to see this was a rare, Protected satyr, Parage aegeria aegeria. Hot diggity dog! Those in my field guides bore tiny white eyespots, but this buster’s eyespots featured big, prominent white centers. I shot away, and quicker than that, he flew. Away and out of sight. I love finding rare HolyLand satyrs. No scholar I, but, I have no doubt I’d just shared moments treasured by Them, thousands of years ago. I like that. The 4 or 5 folks who were really excited about the discovery of an Erato Heliconian butterfly were all very familiar with the National Butterfly Center. It was December 2017, Christmas week, and I was there for the first time. I knew the appearance of a Very fresh Erato was very special, it had to be with the excitement that was riveting the air there. An overcast day, with few visitors besides the handful of us there. A fresh Erato! My Canon film camera’s built-in light meter had been giving me fits, that entire time in the Lower Rio Grande Valley. I shot away at this Erato, nevertheless. Here is an underlit view of the left ventral wing surfaces. Despite the obvious absence of light, the orange forewing band shows color true, as does the whitish-yellow hindwing strip. That they appear vivid against the black background is right for this butterfly. Booked again to return in late November 2019. That is good, Very Good. The memories stream back to me. We, Eran, my guide and I were on the peak of Mt. Hermon. Standing on the extreme northeastern border of Israel, Hermon has us looking into embattled Syria. You are seeing perhaps 180 miles of southern Syria. When was this image taken? June 2008. The cow was owned by Syrians, and it wandered to the peak of Hermon, 7,000 feet, to graze. I was searching for butterflies, endangered ones. The views take your breathe away ones. Never to be forgotten. June it was there in Israel, and we hiked with temperatures in the mid-90’s. Eran was a huge man, and he carried liters of water for us, on that mountaintop. Few others were seen up there, and all the time we were under the surveillance of Israeli Army security. That bovine and its 15 or so companions wandered up there, to I suppose, graze. The landmine Eran found, chastened me, and made me wonder how she manages to avoid them, or do they? We sure found special, rare butterflies that day, drank drank drank, and managed to avoid other land mines. Now, the farmers and Syrians who lived down there are all dead or gone, replaced by soldiers and spies and ISIS crazies from Iran, Russia, North Korea, the Syrian Army, Hezbollah, People Republic of China and other crazies. You see a pastoral landscape, but what actually followed was . . . a killing field. Men, women and children. I’ve sought to return to this extraordinary mountain top since this day in June 2008. Each year I tried I was forbidden from going up there. The Israeli military control it, and they are ever diligent. Did you stop back where I shared that the Syrians who lived there just a decade ago are all gone or dead? When I think of that, on this day that reminds us of so much, I have trouble grappling with what happened down there, less than a decade ago. I was there for the butterflies, some 10 or so species found nowhere else in the world! What happened down there soon after, just stuns me. This mountaintop, back in 1967 was a bloody battleground. It now is the borderline between Israel and Syrian forces, Hezbollah forces, Russian forces, our own U.S. forces, North Korean advisors, ISIL savages, Pakistani advisors, Syrian ‘Rebel’ forces and who knows who else. That region is gorgeous, rich in wildlife and desperately needs a rest, say 100 years of Peace?